During the holidays, we often try to capture the feeling of celebrations past. Usually, that means making traditional foods, whether it’s our great-aunt’s fruitcake or the family eggnog. Holidays have a way of preserving vintage recipes that we’d never normally consider. But one custom has truly died out: the centuries-old tradition of toasting with actual toast. But another theory that’s gained credence among food historians is that the term originates from the surprisingly frequent practice of mixing toast and alcohol. For a time, proposing a toast called for wine or beer, garnished with a slice of bread. Even as sops became less central to the European diet (bread-filled French onion soup is a survivor of the custom), it hung around in drinks. The Elizabethans ladled out wassail, an ancient drink of ale and cider with floating toast, to carolers going door to door. Around the same time, Shakespeare’s heavy-drinking character Falstaff called for a “toast.” But what he wanted was bread along with his fortified wine. Drinking to each other’s health became more popular than ever in the early 1700s, according to linguist Dan Jurafsky. With cups filled with hot wine and ale, topped with soggy bread, drinkers toasted each other with elaborate, clever speeches. It was a type of drinking game that usually ended with everyone getting extremely drunk. Around this time, “toast” began referring to the practice rather than the food. 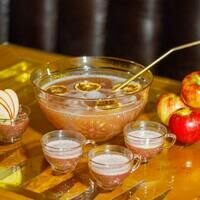 So if you’re looking for a traditional alternative to eggnog during the holidays, you can make a wassail bowl and cover it with toast. (It’s both a drink and a snack!) Or feel free to update the tradition by cramming toast into your Champagne flute. This story originally ran on December 19, 2017. 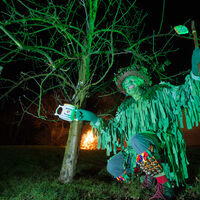 This wintertime serenade for apple trees also involves firing rifles and drinking cider. This spiced, warming drink may have helped broker peace between warring tribes. FBI agents, Prohibition, and beer made American cider sweet and sober. Grabbing a drink once meant moonshine in a neighbor's living room. They tried to make industrial alcohol too lethal to drink. Baked in traditional adobe hornos, this bread is a staple of the American Southwest's Native Pueblo people.